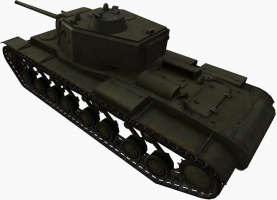 The KV-4 is a Soviet tier 8 heavy tank. 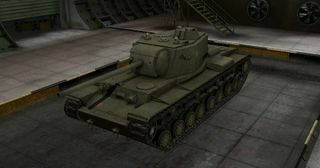 It is in many ways the antithesis of the IS-3 - it is slow but heavily armored, just like the KV-5, and has the same pitiful turret traverse speed. 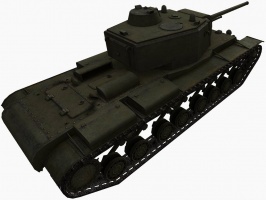 This ensures that the KV-4 is ill-suited to defend against flankers or circling tanks. While it does have 180mm of frontal armor, it is nearly unsloped and it is recommended that the hull of the tank be angled to maximize its effect and make use of the sturdy sides. The long 107mm's penetration and damage are comparable to those of German long 105mm from the Tiger II and it is relatively accurate. While the gun may be accurate it is NOT to be used as a sniper. This tank weighs over a 100 tons, roughly 53% of the Maus's weight and only 29 tonnes lighter than the E-100 . The weight ensures that any tanks that dare ram this tank will receive a harsh punishment. 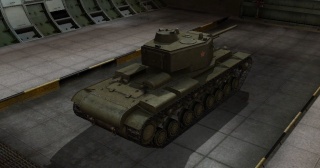 The KV-4 leads to the ST-I. Heavily armored, especially sides and turret and thick tracks. Very good sidescraper. Despite a very slow turret traverse speed, the KV-4 can dogfight against mediums rather well. Your near-mythical armor values will at times lead to your allies abandoning you against enemy tanks, which rarely goes well. 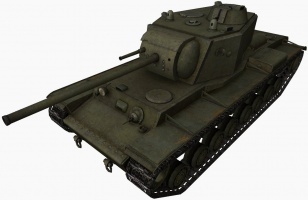 Equipped with the 107mm gun, top engine and turret, it will become in many ways superior to the KV-5, as they both share the same amount of armor but the KV-4 lacks the weak frontal "R2-D2" radioman turret from the KV-5, and has superior penetration. Unfortunately, the KV-4's top gun has a very slow fire-rate and low DPM, less than 1700 damage per minute (base with 100% crew), while the KV-5 has 2100. Another problem is the long aiming time. 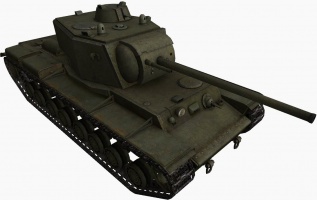 The KV-4 also has slower top speed, making ramming less effective. It should also be noted that the KV-4 is a fairly decent tank to play, especially if you have cover from artillery. It is very bouncy, and many shots, including those from Tier 8, and sometimes even tier 9 TD's will ricochet if tank is angled properly. Note that miniturret on top of update turret is not really a weak spot, but has the same armor as the flat turret face. It's possible to angle the turret between shots to increase its effective armor. Coaxing out a KV-4 from a narrow defensive position will take great effort, especially on alleys or bridges, and even so, it shall be noted that the indicated side armor value does not account for the fact that shells hitting the sides will also have to go though the massive tracks, much to the dismay of the enemy. 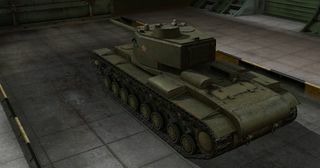 In addition to its thick side armor, the mid-mounted turret allows it to use side-scraping techniques much more effectively than the front mounted turrets used by most other tier 8 heavy tanks. Researching the long 107 will be top priority as the penetration of the 122mm gun is inadequate for the KV-4 as a tier 8. Once the 107 is researched and mounted, it is possible, and somewhat plausible, to simply grind on through to the ST-I. None of the other modules transfer through, and you can equip the 107mm on the stock suspension without having to purchase torsion bars. If however you feel that the extra mobility that the suspension, engines and turret traverse (2 extra degrees/s) provide are valuable follow the research guide below. 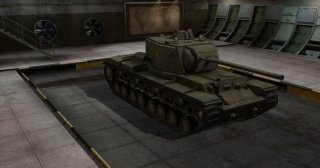 The KV-4 (Object 224) was a proposed Soviet heavy break-through tank, developed during World War II. 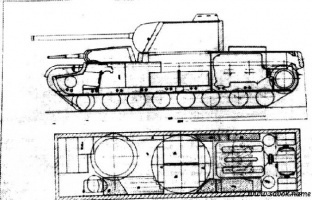 Part of the Kliment Voroshilov tank design series, it never progressed past a series of feasibility studies. 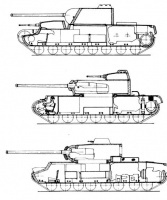 In April 1941, it was decided to create a project for a new Super-heavy tank. It was supposed to be able to defeat any German heavy tank. The project was intended to remain an unbuilt design, until it was needed. 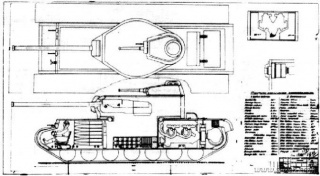 Several tank designers were told to create basic concept drawings. Sources differ as to the designers involved. Among those listed are: Kreslavsky; Kuzmin, Tarapatin and Tarotko (who together worked on the same design); Pereverzev; Mikhailov; Kruchenykh; Tseits, K. Buganov; S. Fedorenko; G. Kruchenykh; F. Marishkin; G. Moskvin; N. Strukov; A. Yermolaev; L. Sychev; L. Pereverzev; Bykov; N. Dukhov; M. Kreslavskiy; V. Pavlov; D. Grigorev. Basic armour was to be 125 to 130 mm and up to 150 mm over vulnerable areas. A new gun was required. There were about 20 different designs generated by the project. The lightest design was 82.5 tonnes and the heaviest was 107.7 tonnes. All had a 107mm ZiS-6 main gun and all but one had a second tank gun. The second gun was a 45 mm 20-K, or a 76 mm gun. Solutions to the positioning of the guns – turrets or hull mountings – varied. Crew requirements were from 5 to 9 men. The tank was never needed and by the end of the war, there were superior heavy tanks the IS-3 heavy tank already in production. The F-42 107 mm tank gun was created in Plant #92, in a design bureau under the supervision of V. Grabin. The F-42 was based on the F-39 95 mm tank gun and it was finished in the fall of 1940. By the beginning of 1941, the new gun had been factory tested in a field casemate. 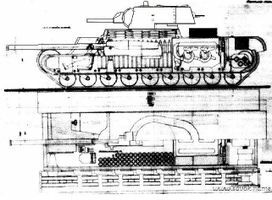 In March 1941 it was tested in the turret of a KV-2 tank. The ZiS-6 gun passed factory testing by June 1941, after which it was sent to the Artillery Scientific Test Range at Leningrad. According to V. Grabin ("Oruzhie Pobedy" - "Weapons of Victory") about 600 ZiS-6 guns had been finished by the fall of 1941. Those guns were all destroyed because the tanks were never going to be made. The plants chief designer wrote that "five serially-produced ZiS-6 cannons were manufactured in July-August 1941, after which their production was halted because the heavy tanks were not ready". Those documents had been signed by V. Grabin. KV-3 & KV-4 Heavy Tanks at battlefield.ru.